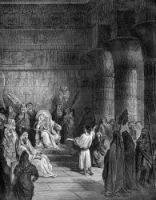 Joseph, the elder of the two sons of Jacob by Rachel, was born in Padan-aram (Mesopotamia) about 1746 B.C. He is first mentioned as a youth of seventeen years old. Joseph brought the evil report of his brothers to his father, and they hated him because his father loved him the most. Jacob had shown his preference for his son by making him a long tunic with sleeves worn by youths and maidens of the richer class. Then came Joseph's Dream. He had two prophetic dreams, clear enough of significance, and he unwisely told these to his brothers. First he dreamed that a sheaf of grain which he was binding, stood erect, and the sheaves of this brothers "gathered round and swayed toward it, bowing." Next he dreamed that the sun and mood and eleven stars came and bowed to him. Even Jacob was indignant when Joseph told this second dream. Yet the proud father treasured the dream in his heart. Later, while in prison in Egypt, Joseph became a "seer"; he listened to the prophetic dreams of others and interpreted their meanings. Joseph would also gain favor with the Pharaoh by interpreting his dreams as well. 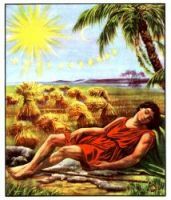 This series of images about Joseph's Dream and about his ability to interpret other people's dreams, are from my collection of antique Bible books. Feel free to use these pictures of Joseph's Dream in your artwork. Click on the Joseph's Dream illustrations below to see more details about saving a free Joseph's Dream image or about purchasing the images about Joseph's Dreams at a higher resolution.